It's no surprise that processed foods have been vilified as a cause of obesity, disease, and the reason Americans know next to nothing about eating healthy. Generally speaking, it's safe to say that subsisting on microwave dinners and packaged pastries is going to cause problems, so this criticism is largely merited. Unfortunately, "processed food" is one of those blanket nutrition terms, like "all-natural" and "eating clean," that doesn't have a very clear definition. Since the vast majority of people aren't farmers, they go to grocery stores, where most food has undergone some level of processing. Produce has to be harvested, cleaned, and shipped; bread needs to be baked; your favorite spreads and oils have to be pressed, mixed together, and packaged. So before you completely write off processed foods as the root of all evil, here are some healthy staples that require a decent amount of processing. Bread is one of the original processed foods, and though it's been shunned by many health-conscious eaters (GLUTEN IS THE DEVIL), there's no need to ban it entirely if you don't have celiac disease or another autoimmune sensitivity to wheat. There are tons of better options than just the cheapest loaf of white bread at the store: sprouted loaves and 100% whole-grain breads offer the fiber you desperately need in your diet. 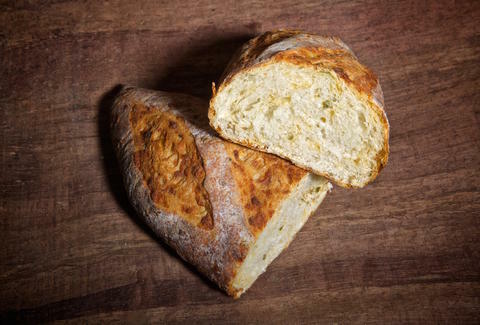 But bread also has to be created from scratch; wheat must be milled, then turned into dough, and baked. If you're looking for the most true-to-unprocessed version of bread possible, look for sourdough loaves that only contain flour, salt, and water. 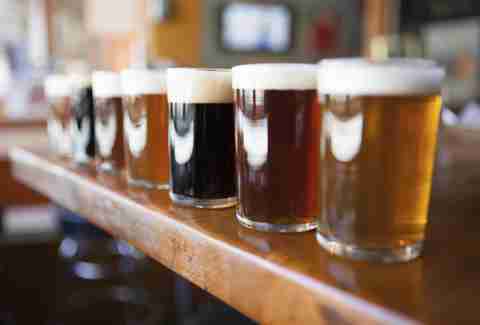 Look, beer is necessary for human survival, and is absolutely healthy in moderation. Plus, it'll help motivate you to exercise more. You know it's processed via brewing barley, yeast, and hops -- stuff like herbs and spices make their way in there more frequently now -- but that doesn't stop you from drinking it. Nor should it. If beer isn't your thing, pick up a glass of red wine, which is good for your heart and your sanity. EVOO is perfect for virtually any food occasion; a dip for bread, a major ingredient in sauces, and an excellent low-heat cooking oil. It's also full of the healthy kind of fat, monounsaturated, which is why it's associated with important things like not dying. You can't imagine your cabinet without it, but olive oil isn't just siphoned off of an olive tree; it's made by pressing whole olives -- usually done by machine -- then is bottled for your consumption. Same goes for coconut oil, peanut oil, and all the other healthy cooking oils. Don't try and be a hero and make your own. Buy it from the olive oil gods who know what the hell they are doing. Baby carrots aren't naturally grown on baby carrot farms, as adorable as that would be. They were actually invented as a way to save carrot farmers from throwing away all their ugly carrots, because Americans can't handle eating a vegetable if it's less than the Platonic ideal of that vegetable. Now all those ugly carrots get cut down into the cute baby shape that's perfect for being packed up and sold at the grocery store, to help you get your vitamin A. With more and more people shunning dairy milk -- a whopping 65% of adults are lactose intolerant anyway -- plant-based milks have exploded on the marketplace as a preferred replacement. Almond milk is especially popular, and at just 30 calories and no sugar per serving for the unsweetened varieties, a healthy alternative in moderation, assuming you avoid the versions made with loads of stabilizers and preservatives like carrageenan. You're going to be shocked at this next fact: almonds don't naturally produce milk. They must be picked, pulverized with water, strained, and most versions have salt and at least a few preservatives thrown in. Despite what you may have heard, almond milk is still more environmentally friendly than dairy milk, and has more calcium to boot. If your body digests dairy just fine, then protein-packed Greek yogurt is a perfectly healthy option to keep in your fridge. Make sure it's plain, of course, because flavored yogurt typically means you'll get an unwanted heap of sugar. Greek yogurt is made from a highly specified process. First, regular yogurt is made by fermenting fresh milk with lactic bacteria, then that yogurt is strained to remove the whey (liquid that’s left after the milk is curdled), leaving you with thicker, more protein-dense Greek yogurt. Also, that bacteria you eat with your yogurt helps boost your microbiome, which is important for maintaining your immune system. 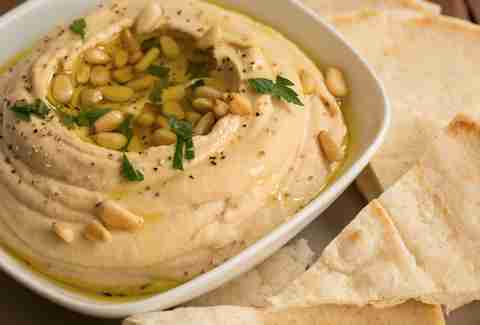 Hummus has become a staple in American households, perfectly complementing raw veggies and pita bread. It's low-calorie and packs enough of a punch of protein and fiber to make it satisfying. The stuff you buy in the refrigerated section of the grocery store is basically just chickpeas blended together with some olive oil, tahini, lemon juice, and spices. You could do all that yourself, but let's get real here; it's also a great snack to eat before a night of drinking, so stock up! Nuts are a healthy on-the-go snack, thanks to their fat and protein content. Rarely do people pluck their own nuts from trees, shell and clean them, and store them for future consumption. Some nuts -- especially flavored ones -- are packaged with extra sodium and food additives, but for the most part, the almonds and cashews you find in bags at the store are pretty whole foods. Eat them to your heart's content! Kombucha can help promote healthy digestion, thanks to the live cultures floating around in there. The tea is fermented with the help of a SCOBY, which is basically a gooey bacteria culture that also boosts your microbiome, the key to health and probably happiness. Kombucha companies ferment and bottle their own stuff in big batches, and the whole process takes time, effort, and a healthy SCOBY (that's just fun to say) -- not to mention the tea component, which gets its own processing -- so you're better off just relying on the pros. This is the refrigerated version, not the stringy canned kind your parents used to buy for Reubens, which your parents definitely did. Like kombucha, real sauerkraut is also fermented using friendly bacteria, once again helping out your digestion and microbiome. If you haven't gathered this, any naturally fermented product that provides you bacteria is going to be good for your gut, so buy a bunch of fermented goods and let them work their probiotic magic on you. Christina Stiehl is a Health and fitness staff writer for Thrillist. She's really upset frozen pizza didn't make the cut for this list. Follow her on Twitter: @ChristinaStiehl.